Away from the busy streets, yet within walking distance of downtown Fairhope, a winding driveway takes you through a beautifully landscaped camellia and azalea garden. 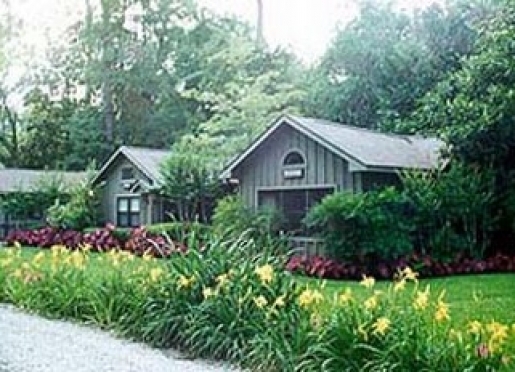 Situated on a secluded three acre home site on the shores of Mobile Bay, the Guest House with its cottage suites awaits your visit. 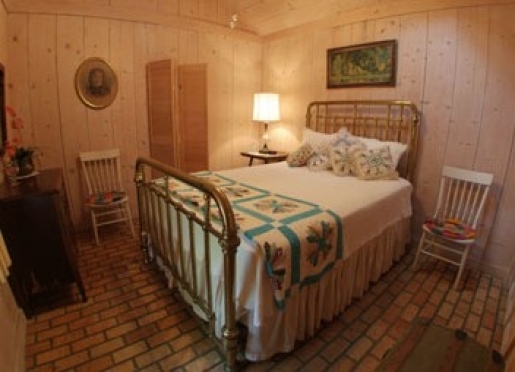 From Bed & Breakfast Encyclopedia ~ American Historic Inns ~ 10 Best Waterfront Inns. The Road Best Traveled ® Newsletter searched the country for 10 Waterfront properties that are special places to rest the mind, body & soul. 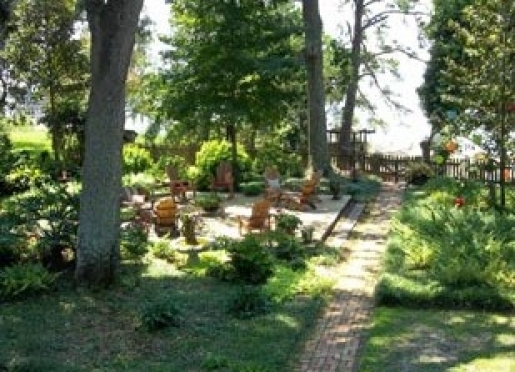 "Bay Breeze Bed & Breakfast - Fairhope, Alabama was among the top 10". Travelers are always looking for memorable and relaxing experiences. Let’s discover more through the words of our innkeepers. Many thanks to Becky Jones for sharing her own secrets with BBOnline.com! 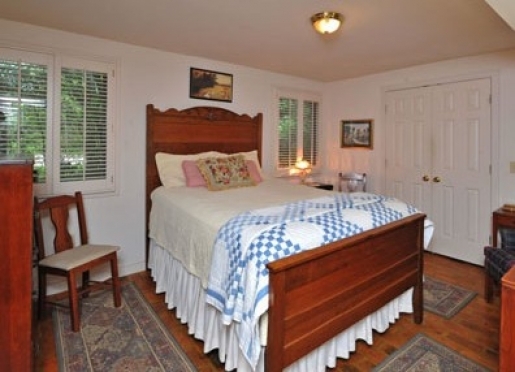 Our guests stay here because they want to stay with people who are natives of the city. Bill & I have lived in Fairhope all of our lives and have a lot of knowledge about the area and its history. We provide a true local experience for our guests. 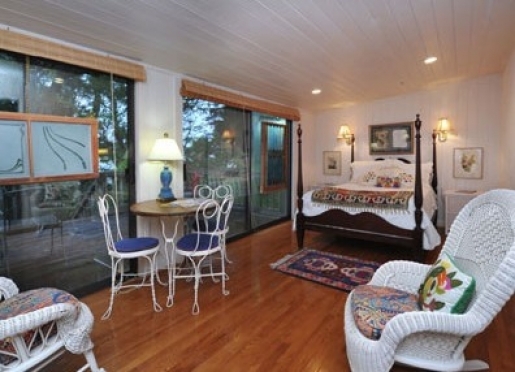 We are best known for being right on the water with our own pier, beach, decks, and beautifully landscaped gardens. Fairhope has wonderful, friendly people. 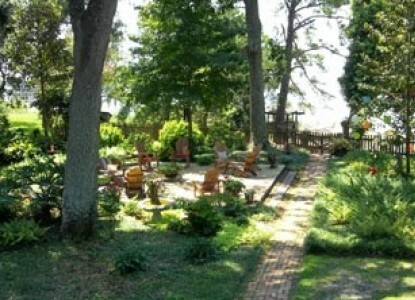 We have many artists, antiques, writers, 3 golf courses, beaches, and outdoor concerts. There is plenty to do here! Our biggest compliment is our return guests; 92% of our business comes from repeat guests and referrals. Fairhope is a very unique community founded in 1894. We are the only surviving single tax colony in the U.S. The largest naval battle of the Civil War was the Battle of Mobile Bay. Fairhope is known for eccentric and unique people; the lady who lived in a tree, the spider lady, and the Hermit’s House. Fairhope also had the first library in Alabama. We can keep you as busy as you would like to be! As listed above there are artists, antiques, writers, 3 golf courses within 5 minutes from the B&B, beaches, and outdoor concerts. People should visit the World Class Potter and visit the Hermit’s House (a beehive house made of stone), or just relax and enjoy the beach and gardens on the property. We have the largest one day sailboat race in Mobile in April, and an Arts & Crafts show in March. We are within walking distance to the beach, 2 excellent restaurants, a candle shop where they make and sell beautiful candles, a deli and a bakery. 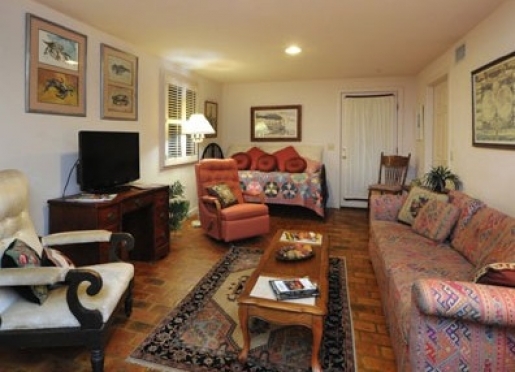 It is a 20 minute walk through parks to uptown Fairhope. The parks have beautiful art sculptures. Our favorite restaurant is Guido's Restaurant, serving eclectic Mediterranean cuisine. This is also one the best kept secrets! I have made booklets for the guests with a lot of information and things to do in the area. We accept pets on a limited, case by case basis. 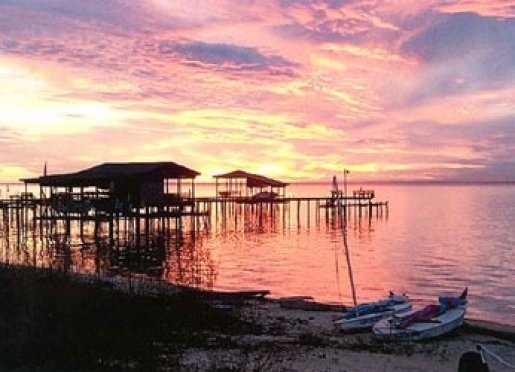 Fairhope is a secluded, enchanting village on the eastern shore of Mobile Bay. A town boasting five blocks of specialty stores, art galleries, antique shops and cafes. Street corners and hanging baskets bloom all year long. Stroll the tree-lined streets, wander in and out of more than 65 friendly shops, rest in a shady courtyard, then stop for a tempting bite to eat. 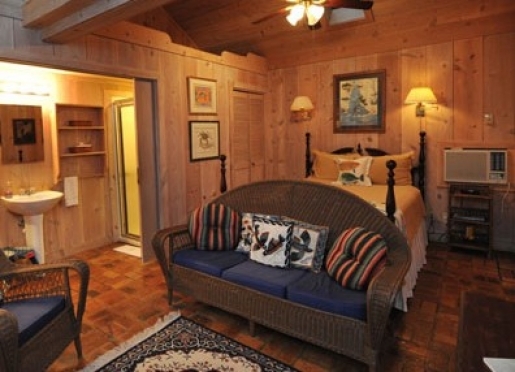 Come for a day or an entire vacation to enjoy the tranquility and charm of southern living at its finest. 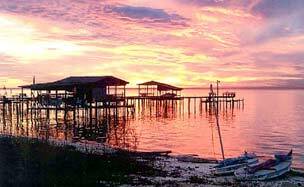 Romantic Fairhope - the best kept secret on the Gulf coast - extends southern charm and hospitality to you and yours. Dauphin Island Regatta - the nation's largest one-day sailing regatta. The award-winning rose garden encircling the fountain at the Municipal Pier. True American 4th of July - fireworks, boat races, picnics, etc. In the North they have the changing of the leaves, in Fairhope we have the changing of the sky at sunset - reds, oranges and purples - spectacular! Polo At The Point - an October tradition - thoroughbred ponies, chic ladies and GQ gentlemen. All in their finest attire, on the sideline waiting to do their part along with the "tailgaters" - stomping those divots back into place. The Grand Festival of Art on the lagoon at the Grand Hotel - all types of artisans display their talents under the canopied oaks. The Lighting of the Trees - over one million illuminate the town. Sparkling - exciting - magical! Mardi Gras parades - colorful floats, masked riders, sequined ball gowns and MOON PIES - get ready to catch those beads and doubloons. Camellias and azaleas at their absolute peak. Fairhope's bulb display - tulips, daffodils, hyacinths stop many for photos to take home. 5 golf courses within 10 minutes. The entire downstairs of the house is devoted to the guests. 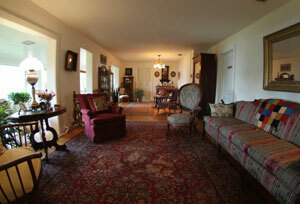 A sitting room, extended living room, bay room and dining room where breakfast is served all have bay views. Two open decks offer porch swings and wooden gliders for a taste of the bay air. One of several common areas, the sitting room offers a cozy fire in the winter and a spectacular garden and bay view year round. A great grandmother's china cabinet provides an interesting display in the extended end of the Living Room. Many antique clocks like the one pictured here are found throughout the home. 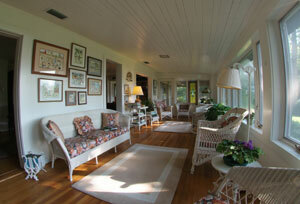 The Bay Room, with its antique wicker furniture is a popular common area for guests to gather. The Dining Room in the main house provides a view of Mobile Bay. In the North, they have the "changing of the leaves", at Bay Breeze, we have the "changing of the sky at sunset" --what a site to behold! 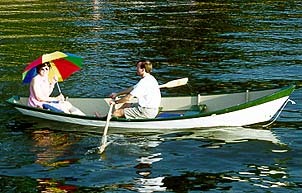 Sailboats, kayaks, a vintage rowing dory and of course, bicycles are all provided for the use of our guests. Open decks are for lounging in the sun, fishing or crabbing. During the summer and early fall months you may be privileged to take part in an unpredictable seafood "Jubilee". Guest are invited to share the spectacular view of historic Mobile Bay from the sitting room with its cozy fireplace, the glassed porch bay room and living room. The family kitchen where breakfast is served each morning allows you to watch the seagulls wheel and dip through the air and the aerially graceful pelicans as they plummet into the bay for fish. 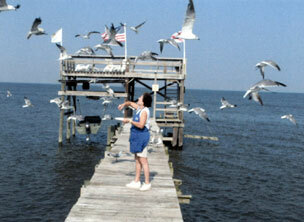 White seagulls and blue water add to the outdoor pleasures of Bay watching. 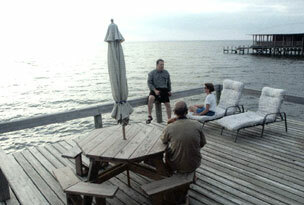 Guests often gather on one of five spacious decks to relax and enjoy the openness and serenity of life on the bay. Your hosts, are life long residents of the area and are always available to cater to your needs, answer questions and simply make sure that you enjoy your visit. 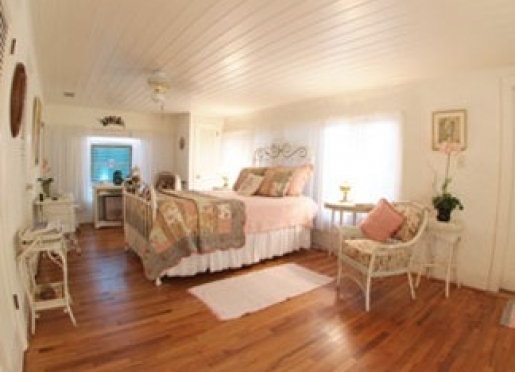 We are now into our second decade of providing the finest B&B service on the bay. The fact that our business is 93% repeat and referral tells you that we "know how to do it right!" 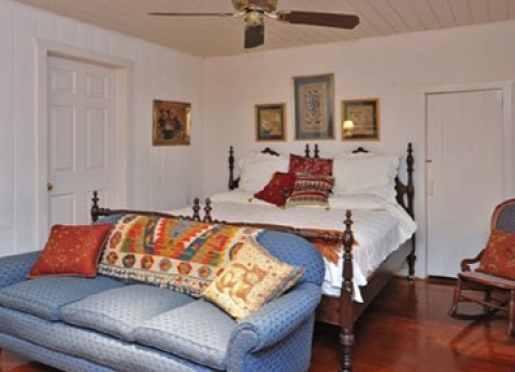 We know that you will enjoy your stay at Bay Breeze on the shores of beautiful Mobile Bay. All of our guests receive our complementary cookbook to take home as a reminder of the good times spent here. Our guests can enjoy the wide sandy beach for walking and collecting drift wood. 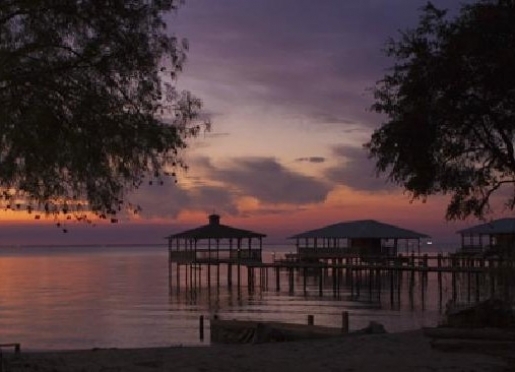 The 462 foot private pier has large covered areas perfect for afternoon naps, picnics, or just watching the spectacular sunsets on Mobile Bay. 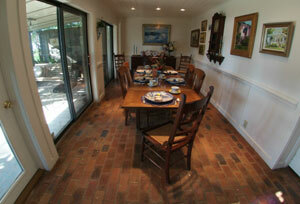 Excellent restaurants and shops are available within walking distance in downtown Fairhope. A wonderful sidewalk that follows the beach is perfect for morning or afternoon strolls. 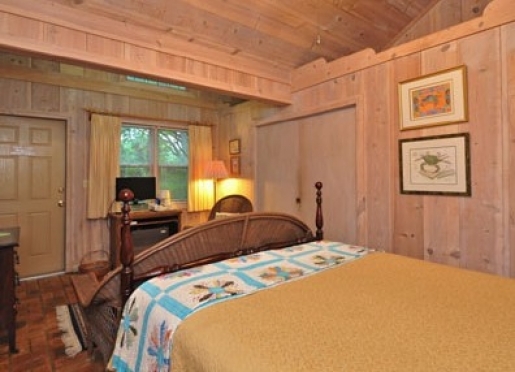 Wireless, high-speed internet access is now available for guests at Bay Breeze. 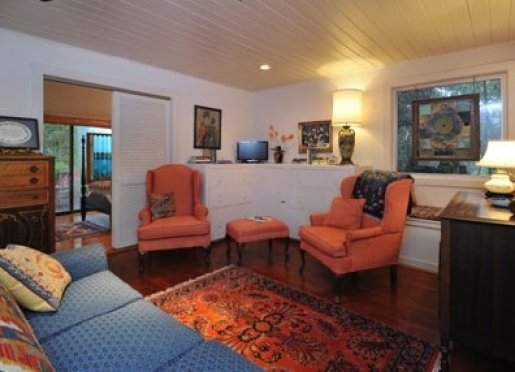 This unique bay front stucco home was built in the early 1930's and has been lovingly restored, remodeled and enlarged through the years to hold family heirlooms and period antiques which date back five generations. 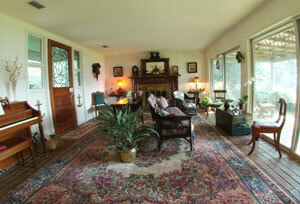 Wicker, stained glass, hooked and oriental rugs abound in every room. Everything from a mantel to a sofa or silk tie quilt has a very special story. 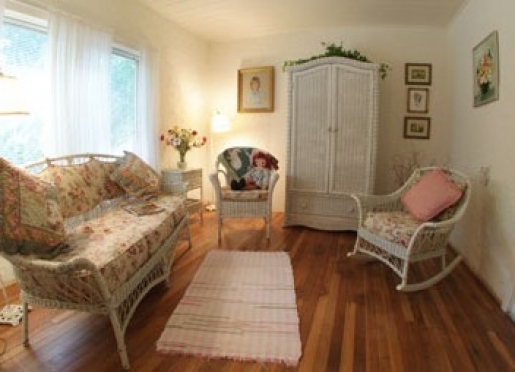 The entire downstairs of the house - a sitting room with fireplace, glassed-porch bay room, living room and kitchen - is devoted to the guests of Bay Breeze. From I-10 at exit 35, turn south onto U.S. Highway 98 East. 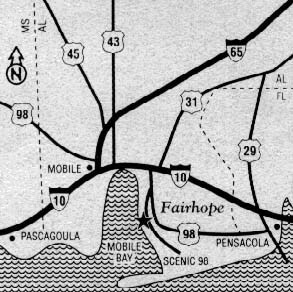 Go 9.5 miles and turn right onto Baldwin County Highway 48, which is Fairhope Avenue. After passing through three (3) traffic lights, continue for three blocks and turn left onto S. Mobile Street. Bay Breeze is one mile on the right. Look for the yellow flag.